Poach eggs the easy way, in the microwave in 60 seconds! Serve on top of Turkish bread, hummus and mushrooms for a satisfying vegetarian breakfast. Before you start, boil a kettle and place a medium frying pan over a medium high heat. Add the oil and mushrooms to the preheated frying pan and lightly season with salt. Fry for 3 to 4 minutes, or until cooked. Add the parsley and stir through. Keep warm. Fill a bowl (a dessert or deep soup bowl is ideal for this) with boiling water until 1/2 full. Add the vinegar. Pre-program your microwave with the cooking time (55 seconds is what works for my microwave), leave the door of the microwave open and place the egg and a bread plate next to the bowl. Use a spoon to stir the vinegar water until you see a slight whirlpool effect. Remove the spoon and let the whirlpool settle slightly before cracking the egg in the center. Immediately cover with the plate and place in the microwave and cook. Remove the bowl from the microwave and check that the white is cooked. Cook in 10 second bursts until cooked. Use a spoon to remove the egg from the bowl and drain on a plate lined with a piece of paper towel. Repeat the process with the second egg but subtract 10 seconds off the time as the water and bowl will be extra hot from cooking the first egg. 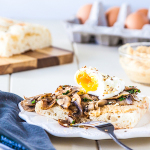 Divide the hummus between the pieces of Turkish bread and top with the mushrooms and poached eggs and sprinkle with dukkah. Serve immediately. If, after poaching the first egg your bowl has pieces of egg white floating in it, discard the water and add a further 1 tsp of vinegar before adding the egg. The amount of time required to poach an egg in the microwave will vary greatly depending on your microwave. 55 seconds is perfect in mine, but you may need to vary this in yours. If you start to hear popping when poaching your egg immediately stop your microwave as it's likely the egg is overcooked and about to explode.